Alberto Contador’s Saxo Bank team announced on June 25 that title sponsorship of the team would be split through 2013 between Saxo Bank and Tinkoff Credit Systems. The Tour de France roster will introduce the new kit this weekend at Le Grand Depart in Liège. 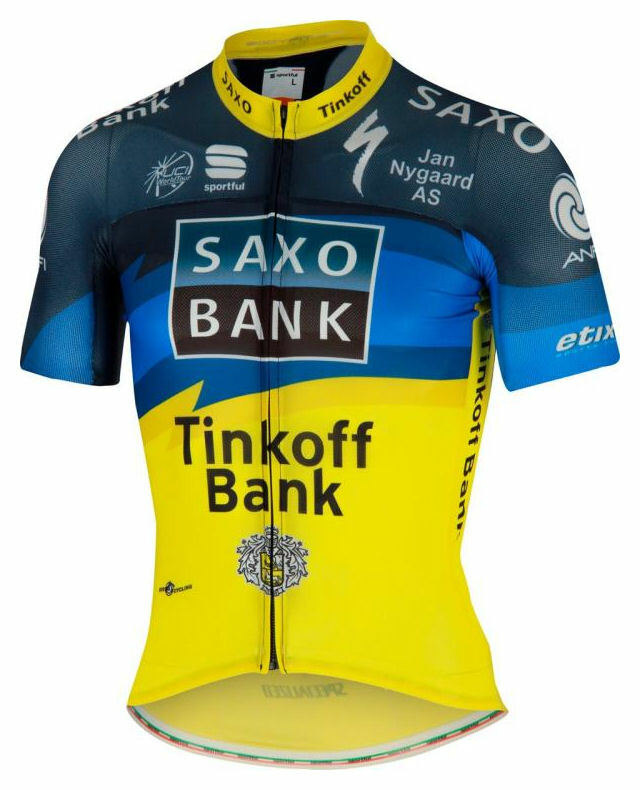 The new team kit retains the royal blue of Saxo’s orginial 2012 design, pairing it with a victory yellow – also the trademark color of Tinkoff. The Eagle of Herning design elements are preserved in the wing-shape (or flame) image on the back of the bib shorts (see view 2), with a hint remaining above the yellow field on the jersey. The new jersey looks very interesting and the colourblocking blue-yellow reflects coolness and passion. I am curious to see Alberto in this new outfit!